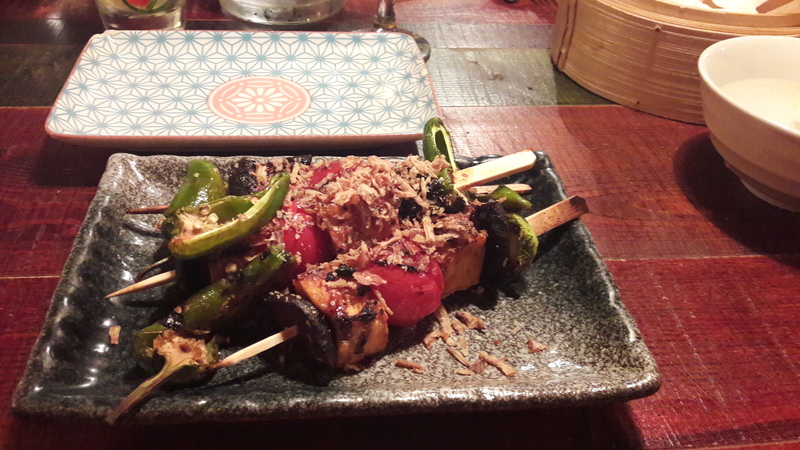 Myagi is a little taste of pan Asian paradise in the heart of South Liverpool. Specialising in small plates, there's choice aplenty as you select your dishes from the garden (veg), land (meat) and sea (fish). As any good restaurant knows, with good food good ambience should follow. Myagi's inviting décor includes Asian style low-level lighting and grand golden ceilings, whilst the walls are peppered with customised, stunning street art style pieces from local artist Cyclops Ape, whose handiwork includes a fitting array of blossom trees, geishas and koi carp amongst other designs. If you're a Myagi first timer, then don't let the mention of 'small plates' deceive you, as portions are all fair to middling in size. We left our visit full to the brim, harbouring some pretty impressive food babies! If you're not a lover of spice, then perhaps Myagis isn't for you, as 90% of the dishes have a noticeable kick to them. 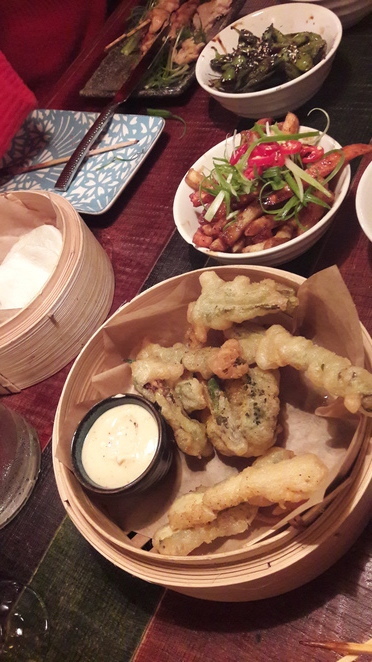 That said, there are still some equally tasty and accessible dishes to be found, including the moreish mixed vegetable tempura with miso aioli dip, and the select range of ramen dishes on offer. 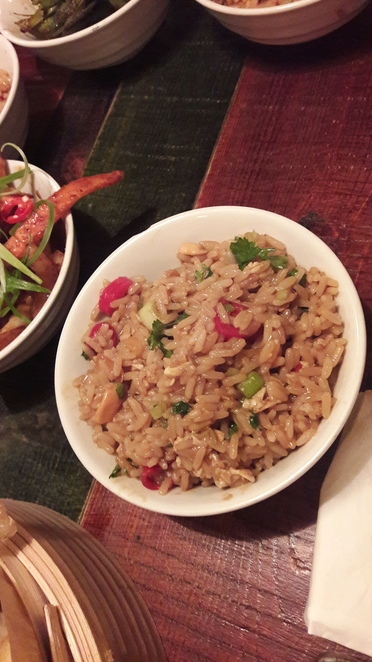 Highlights of the evening menu included the special fried rice (suitable for veggies) which spanned a complete fusion of flavours and textures with every bite, including sweet pineapple, crisp red chilli, crunchy cashew and bursts of refreshing coriander. Perhaps an understated highlight of the menu for me had to be the robata fired yakinikunashi - grilled sriracha tofu skewers with pickled shiitake mushrooms & shishito pepper, delightfully spicy and packed full of flavour for a more than reasonable £6.95. 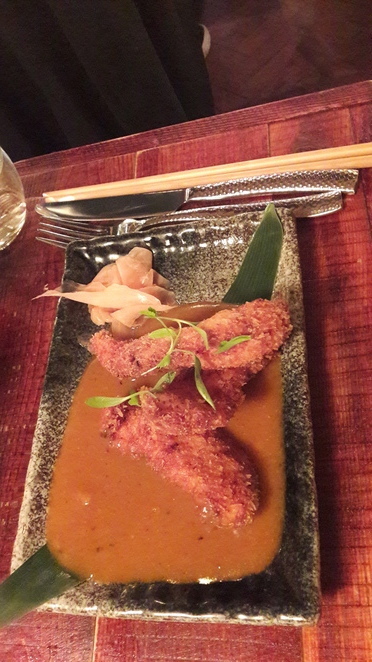 If you're after more of a hearty classic, I'd recommend opting for a katsu chicken curry or the bento box. Wash it down with a refreshing 'cleanser' or choose your poison from their 'opium den cocktail menu'. If you have any room left afterwards (doubtful! ), I'd highly recommend rounding things off with Mrs. M's Chocolate brownie spring roll, served hot with coconut ice cream & raspberry compote. Myagi is open from 12 noon everyday where guests can chow down for dinner, drinks or grab a booth and make an evening of it. They've recently opened another venue in Ormskirk too and booking online is advised.